This would of been a lovely shot apart from the glare on the front upper deck but then again it does not take anything away from the sleek lines of a Duple bodied bus. There is as usual the decoration associated with Duple more a coach than a bus builder on this vehicle which did spoil the looks sometimes. I started looking into the history of this operator but what a minefield Scottish Omnibuses Ltd was made up of three separate operators Eastern Scottish, Baxter’s Bus Service and Stark’s Motor Services. I think the history of the Scottish Bus Group of Alexander, Highland Omnibuses, MacBrayne, S.M.T. and Scottish Omnibuses is far to complicated for this posting more for an article if anybody is up to it. I liked these Duple bodies with the mouldings. However, am I right in thinking that Duple only made lowbridge versions with these features? I can’t think of any highbridge examples. I’d love to be proved wrong. As far as I know you’re dead right about there having been no highbridge Duples of this design on AEC chassis, more’s the pity. The Red and White group had a number of very nice examples of both lowbridge and highbridge design on Guy Arab III chassis though. In addition to the "home fleet" four highbridge models were delivered to the Venture, Basingstoke fleet in 1950. These were reallocated to the former Newbury and District fleet when only a few months old. Here they joined one highbridge and two lowbridge examples of a similar vintage, all of which survived in Thames Valley ownership until 1968. Newbury depot also had some utility highbridge Guys and, following a couple of low bridge incidents when highbridge vehicles had been allowed to accidentally strayed onto the Lambourn road it was decided to renumber them in a series H1-H16, the splendid Duple bodied examples being H10 (the original N&D example) and H13-6 (the former Venture vehicles). The two lowbridge vehicles, which had platform doors and heaters as well as what were effectively dual purpose seats from new and which had been chosen to compete with the Lambourn Valley railway on the Newbury – Lambourn routes, retained their original numbers, 170/1. I quite literally grew up with these buses and they were absolutely superb. The highbridge examples were a little less luxurious than the lowbridge but still of a very high spec. Despite being non standard in the Thames Valley Bristol/ECW fleet they were very well thought of by both drivers and engineering staff and were both well used and beautifully presented throughout their lives. The two lowbridge examples were still invariably on all day workings up to their withdrawal. Sadly, despite rumours to the contrary none survived to see further service or preservation as at the time of their withdrawal Gardner engines were worth a fortune and all seven of these are believed to have ended up powering junks in Hong Kong! The buses that they came from were all scrapped very quickly thereafter. A beautiful Red and White highbridge example lives on in preservation though. This AEC Regent would have been new, or acquired, to SMT Scottish Motor Traction and is seen in a variant livery in the transition to Scottish Bus Group, which was created ca 1964 and reorganised the SMT companies into Western SMT, Central SMT and Eastern Scottish, and the Alexander’s empire into Midland, Fife and Northern. The Edinburgh SMT company had changed to Scottish Omnibuses, to differentiate itself from SMT Motors (the original parent), which continued as a Vauxhall dealership in Edinburgh Fountainbridge and Lothian Road. Scottish Omnibuses had acquired/merged with Stark’s Dunbar, Baxter’s Coatbridge and Lowland Omnibuses (all over the Borders). The first two retained their liveries and identities into the 70s. Somewhat belatedly, may I add some clarification to one or two of David’s remarks? This vehicle would have been new to Scottish Omnibuses: they had 20 in all, BB61-80, GSF644-GSF663. All the constituent companies of the Scottish Bus Group pre-date its formation. Western SMT and Central SMT both date from June 1932. Alexander’s dates from 1914 although the familiar ‘W Alexander & Sons’ name was only introduced in 1924; prior to that, the company had been known as Alexander’s Motor Services. The ‘split’, which created Midland, Fife and Northern took effect on 15 May 1961 although the empire had been split, operationally, into Southern, Fife and Northern Areas prior to that, not to mention David Lawson of Kirkintilloch which was purchased in 1936 but retained as an operating subsidiary until it was absorbed by the newly-created Midland company in 1961. The history of SMT and its various fleetnames is complex. SMT operated its first bus on 1 January 1906. The bus company split from SMT Sales & Servicing at the time of Nationalisation in 1949 but secured an agreement to retain the SMT fleetname for a limited period; the legal name became Scottish Omnibuses Ltd, though. Coaches started appearing with both SMT and Scottish Omnibuses fleetnames in 1959 although, in 1961, the SMT was dropped. In 1963 the fleetname ‘=Scottish=’ made its debut but the SMT diamond was resurrected after about a year, before the company finally settled on ‘Eastern Scottish’ in late 1964. Baxter’s Bus Service was acquired on 1 December 1962 and, initially, buses operating the former Baxter’s routes were painted in a revised version of the SMT light-green livery. The management in Edinburgh, however, not for the first time – or the last – out of touch with operations in the West of Scotland, seriously underestimated the loyalty of the people of Airdrie and Coatbridge towards their local operator; within a few months, after considerable disquiet and criticism in the local press, the management realised their error and Baxter’s blue livery and fleetnames started reappearing on Victoria depot’s buses. This arrangement remained until 1977. When David mentions "Lowland Omnibuses (all over the borders)" he may be mixing the formation of Lowland Scottish in 1985 with the purchase of Lowland Motorways of Shettleston on 13 January 1958. Lowland Motorways’ services to the East of Glasgow and their vehicles, hitherto painted in an attractive livery of two shades of green, were all taken over and their livery disappeared. Lowland Scottish, on the other hand, took over all of Eastern Scottish’s depots in the Borders and, additionally, the former Stark’s depots at Dunbar and North Berwick. Interestingly though, in view of events 25 years later, in May 1960, Stark’s were short of vehicles and hired one from SMT; knowing of Stark’s liking for Leylands, SMT sent them the ex-Lowland Motorways’ prototype Tiger Cub H106, LYS943, and this operated for Stark’s for a very short period. The 20 Duple bodied AEC Regent IIIs were the only Duple bodied AEC double deckers built for anybody. There were a large number of highbridge bodies built to this or a similar design, most notably the Red & White Guy Arab IIIs, but also the 60 bodies supplied to Edinburgh Corporation in 1952 (finished by Nudd Bros & Lockyer, part of the Duple group) on reconditioned ex London wartime Guy Arab II (5LW engines apart from one fitted with a 6LW). These had a partial full front body, but the remainder of the body was the same. The bodies on the ex LT Edinburgh Guy Arabs were not quite the same, Harry. Though based on similar frames, they were built to an extremely lightweight specification that offered a truly spartan level of interior finish. OBP does have a contribution on these buses. I well remember that when the ‘Scotties’ paid their annual exchange visits to YTC at Barnsley in the early sixties, they travelled in AEC coaches with pre selector gearboxes. I seem to remember taking one off the inspection pit as no one knew how these gearboxes worked, except the apprentices who were studying them at collage at the time, and we didn’t have them at the time and in fact never ran the type with the bus-bar ‘Clutch.’ Can anyone tell me about these Coaches which were very luxurious and had toilet facilities and each seat was provided with a travelling rug for the passenger. Scottish Omnibuses had some AEC Regal IVs with Alexander bodies, dating from 1951/3, which match the description – 9821E/9822E chassis and C30Ft bodies. I must say I’m surprised if some of them retained that configuration into the 1960s though. Sorry, I’ve just noticed that the Regal IV coach in the second photo I linked to above had been rebodied in 1957. BLOTW says it was Alexander again, although it doesn’t resemble any Alexander body I’ve ever seen. The AEC by Alexanders registered KSC was damaged in an accident when it came off the A68 at Soutra Hill in snow on its way to London. Alexanders Falkirk fitted a 1955 style front when repairing it. 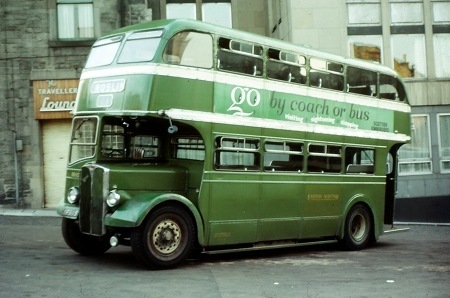 This 1953 coach was one of a pair which had a pseudo Seagull coach line to its side appearance. Noticeable by its hybrid style, I saw this refurbished coach once or twice in Edinburgh.